This is the latest instalment in a continuing series of posts on the (mostly bad) arguments that contrarians make against global warming. A list of earlier parts in the series can be found at the bottom of this post. Claim: Natural CO2 emissions far outweigh our own. 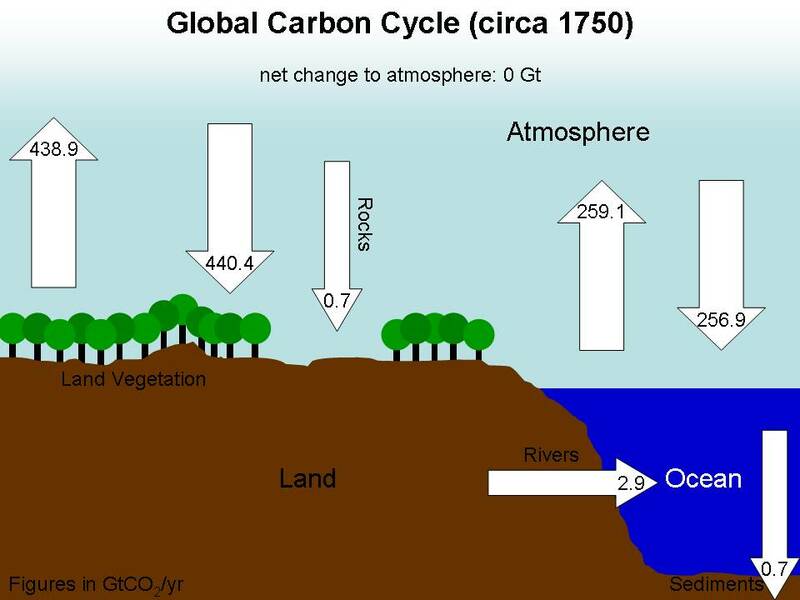 The oceans and land vegetation are absorbing some of the CO2 emitted by humans; these are known as “carbon sinks”. Currently plants on land are absorbing an extra 9.9 Gt/yr, and the oceans an extra 8.5 Gt/yr (although the amount absorbed by the land sink varies wildly from year to year). 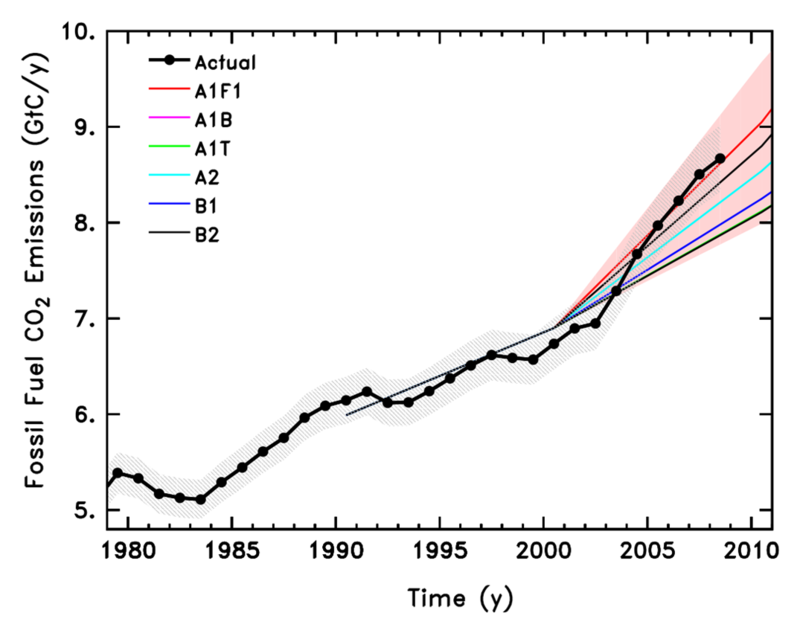 This puts the “airborne fraction” of recent human emissions at 45%, slightly above the long-term average of 43%. Yet neither sink can continue absorbing CO2 forever. The oceans are expected to absorb less and less, and land vegetation may even begin emitting CO2 within a century, accelerating the buildup of the gas in the atmosphere. Most of this increase comes from coal-burning in China and India. (Meanwhile, land use emissions have remained nearly constant for decades and have actually decreased slightly in recent years.) Preliminary figures suggest fossil fuel emissions decreased by 3% in 2009 due to the global financial crisis. However, this should not be taken as cause for celebration, as emissions growth is expected to resume by 2011. Even the relatively sudden increases during deglaciations occurred over thousands of years rather than on human timescales. 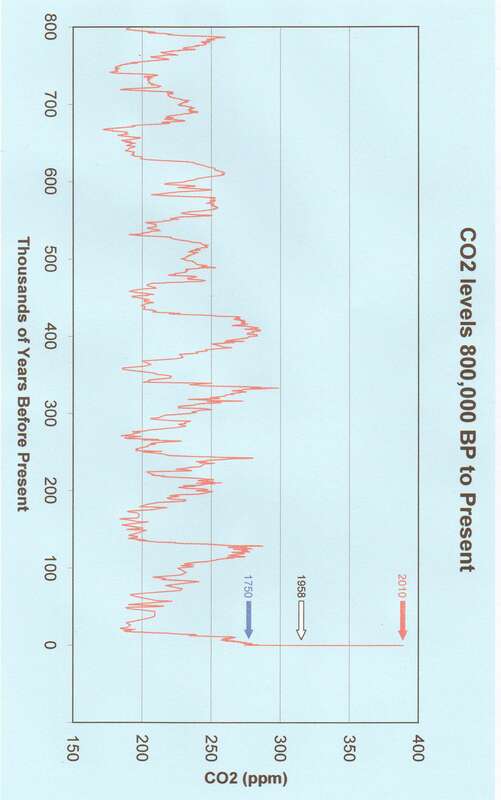 But since 1750, CO2 has risen by 112 113 ppm in just 260 years (about ten times faster than the fastest rise during the Termination IV deglaciation 340,000 years ago). And it continues to rise by 1.9 ppm/yr. Mauna Loa measurements are not the only evidence of this dramatic increase. Mauna Loa is typically cited because it provides the longest-running direct record of CO2 levels, but it has been joined by an increasing number of stations from around the world, allowing a global record to be constructed for 1980 onwards. The extremely good correlation between global and Mauna Loa levels demonstrates that CO2 is well-mixed throughout the atmosphere. The value of 389 390 ppm comes from Mauna Loa, but wherever you look you’ll get a similar number. And these days there are several satellites monitoring CO2 levels, so there is no escaping the fact that global CO2 continues to rise year by year. This rise is strongly correlated with the cumulative total of human CO2 emissions. 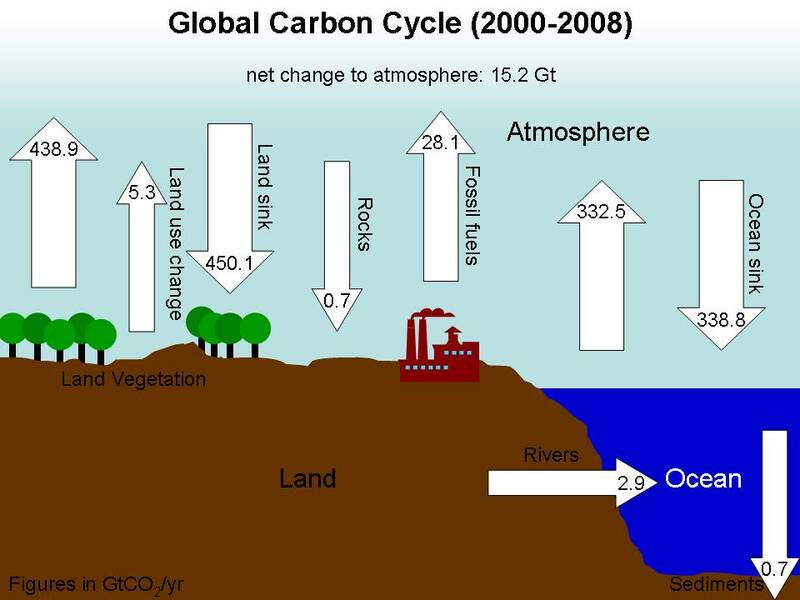 Evidently, all this CO2 cannot be coming from the oceans or land as both are net absorbers of CO2. We know it must have come from fossil fuels, not only because the numbers add up, but also because the various isotopes of carbon provide us with a “fossil carbon” fingerprint. The first sign of fossil carbon in the atmosphere came from the radioactive isotope carbon-14, which is found in the atmosphere (where it is created by cosmic rays) but not in fossil fuels (where any carbon-14 has long since decayed). In the days before nuclear weapons testing, scientists noticed a decrease in the percentage of carbon-14 in the atmosphere. Also, fossil fuels (and living vegetation) contain a lower percentage of carbon-13 than the oceans or volcanoes. Accordingly, the percentage of carbon-13 in atmospheric CO2 is falling. with the tap running and the drain open. The water level can stand for many quantities in the modern world. The level of carbon dioxide in the Earth’s atmosphere is one. A person’s waistline or credit card debt — both of which have also become spreading problems of late — are two more. In all three cases, the level in the tub falls only when the drain runs faster than the tap — when you burn more calories than you eat, for instance, or pay off old charges faster than you incur new ones.